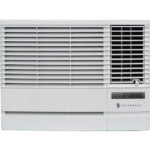 The main factors to consider when shopping for the best window air conditioner is the size or area of the room you are trying to cool down and the cooling capacity of the air conditioner which is measured in British Thermal Units (BTUs) per hour. See the table below to see how much cooling capability is needed for each size of room. Another important attribute to look for is Energy Efficiency Rating, or EER, which measures how energy efficient a unit is (the higher the number the better). No window air conditioner operates silently, but there are differences in how loud some of them are. If you are installing one in your bedroom are other space where you need some peace and quiet then you should strongly consider finding the quietest model you can. We found differences in the noise levels from manufacturer provided decibels and independent testing and differences between tests done by different websites. So in general we try to describe the noise levels in relative terms to compare individual models based on testing done at one time in a controlled environment and not compare the actual decibel numbers from different sources which may be flawed. Below we review our choices for the top 10 best window air conditioners. At the bottom of this article we also have a spec comparison chart for all the models on our list. We selected the Friedrich Chill CP10G10B as the best window air conditioner. Selling for $439, this unit uses 10,000 BTUs to cool up to 450 square feet. It is the most energy efficient AC unit on our list with an EER of 12.2. The Friedrich Chill line is also quiet enough for you to use in your bedroom. Some nice features of the CP10G10B include an easy to use electronic control panel, 24 hour timer, fan-only option, removal of up to 3 pints of moisture per hour, washable filter, and remote control. The biggest drawback of the Friedrich Chill CP10G10B is the price since it is more expensive than some models that have even more BTUs. There are cheaper units available, but if performance and being quiet are the top requirements for you then we recommend the Friedrich CP10G10B. 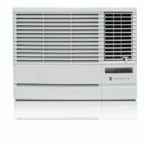 The $349 LG LW1216ER is the best 12,000 BTU window air conditioner on our list. It also received a Best Buy award and the highest overall rating from the leading consumer magazine. This Energy Star approved unit can efficiently cool a room up to 550 square feet. The LW1216ER has a digital electronic touch control panel with three cooling and fan speeds, a 24 hour programmable timer, washable air filter, remote control, and it can remove up to 3.3 pints of moisture per hour to help control humidity. The LG LW1216ER is pretty quiet, but a little bit louder than the Friedrich Chill models. At 85 pounds it is heavy which might make it a bit difficult to install without some professional help. We highly recommend the LG LW1216ER for large spaces, but it might not be the best choice for a bedroom due to the noise level and amount of BTUs. The Friedrich Chill CP08G10B Window Air Conditioner, available for $369, is very similar to the CP10G10B, but uses 8,000 BTUs to cool rooms up to 325 square feet. In addition to an Energy Efficiency Rating (EER) of 11.2, the biggest highlight is that it runs quieter than other window ACs. Other features include a digital thermostat, 24-hour programmable timer, washable air filter, and 3 fan-only speeds. The main drawback of the CP08G10B is the price – it is more expensive than similar 8,000 BTU window air conditioners. Overall we highly recommend the Friedrich CP08G10B for large bedrooms thanks to the quiet operation. 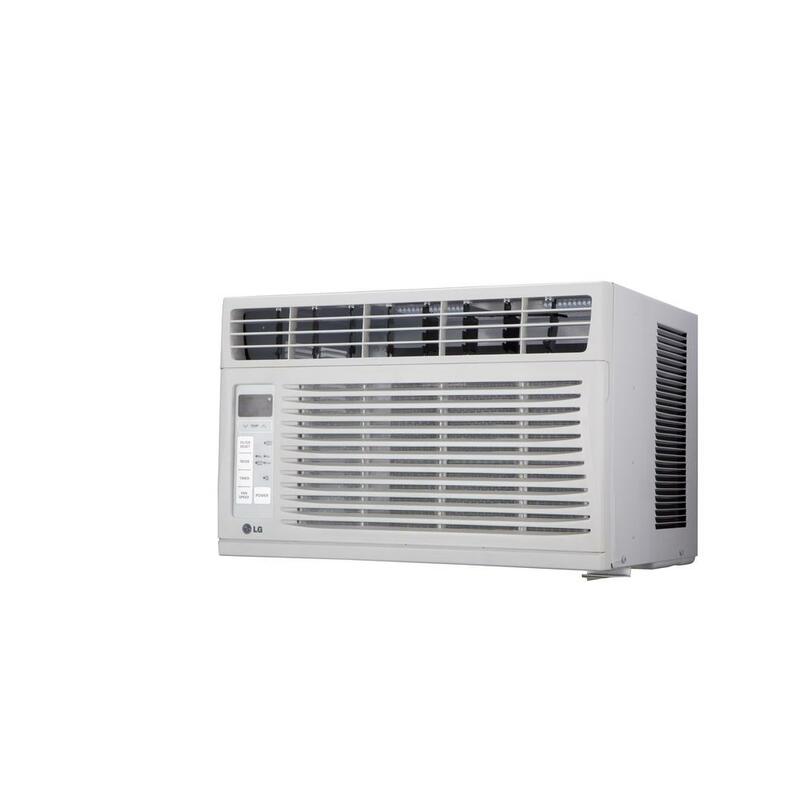 We think the $239 GE AEZ08LV is the best choice for a window air conditioner under $300. We like that it scores extremely positive buyer and user reviews and also received a high rating from the leading consumer magazine. The AEZ08LV uses 8,000 BTUs to cool a room up to 350 square feet very quickly. Other features of the GE AEZ08LV include electronic digital thermostat with remote, three cooling and fan speeds, EZ mount window kit with fixed chassis, and Energy Saver feature. One negative is that while it is not terribly loud, this unit does seem to be a bit louder than other similar ACs. Another solid choice for an 8,000 BTU window air conditioner is the $239 LG LW8016ER. This unit can cool up to 340 square feet with an EER of 12. The LG LW8016ER comes with a easy installation kit, digital touch controls, 3 cooling/fan speeds plus Auto Cool, 24-hour on/off timer, washable filter, and it can remove up to 2.2 pints of moisture per hour to control humidity. Noise-wise the LW8016ER is about on par with the GE AEZ08LV and definitely louder than the Friedrich Chill CP08G10B. 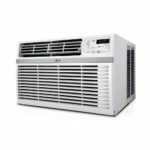 So if you want a window AC unit for your bedroom you might want to consider a different model, but for any other room it probably will not be a big deal. 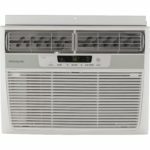 We selected the Frigidaire FFRE0533Q1 as the best window AC unit under $200. At $199 this model has an EER rating of 11.2, is more compact, and puts out 5,000 BTUs which can cool a room up to 150 square feet. It works quickly and quietly to cool down a small room. The FFRE0533Q1 has all the features you would hope for including dehumidification of up to 1.1 pints per hour, simple controls with digital temperature readout, timer and energy saver mode, and remote control. If you only have a small space to cool then the Frigidaire FFRE0533Q1 is a good choice, but for spaces larger than about 150 square feet you should buy an air conditioner with more BTUs. Another option for a 12,000 BTU window air conditioner is the Frigidaire FFRA1222R1 which sells for $340. With a EER of 10.9 it is not quite as efficient as other models, while this unit can cool a room up to 550 square feet. Overall the performance is good with features including multi-speed electronic controls, 24-hour on/off timer, energy saver mode, washable filter, and dehumidification of up to 3.8 pints per hour. The Frigidaire FFRA1222R1 is a bit noisy, but you still should consider this unit for large areas. 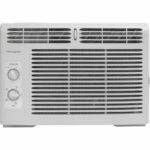 The cheapest window air conditioner on our list is the $139 Frigidaire FFRA0511R1. 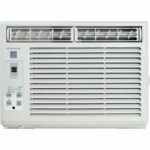 That affordable price makes it extremely attractive to many people and thus it is also the best selling window AC unit on Amazon. This 5,000 BTU mini-compact model has an EER of 11.1 and can cool a room up to 150 square feet. The FFRA0511R1 costs less because it has less controls. It does not let you specify a desired temperature and instead uses mechanical rotary controls to set the temperature (7 settings) and mode (4 settings). There is no timer or remote control. So the Frigidaire FFRA0511R1 is cheap, but it only works for a small room and has limited controls. Thus we only recommend it if price is your biggest concern. 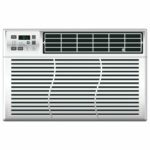 Out top choice for a 6,000 BTU window AC unit is the $179 LG LW6016R. It has an EER of 11.3 and can cool a room up to 260 square feet. It received the highest score for 5000-6500 BTU ACs from the leading consumer magazine. The noise level is average, but it is especially quiet on low settings. The LW6016R has the same features as the other LG models in this series like digital electronic touch controls, timer, remote control, and washable filter, It also can remove 1.8 pints of moisture per hour. If a 6,000 BTU unit is what you need, then we seriously recommend that you buy the LG LW6016R. If you have a large space to cool then you might need the 24,500 BTUs that the $650 LG LW2516ER puts out. This powerful window air conditioner has the same features of the other LG models in this series and can also remove 6.8 pints of moisture to help control humidity. The negatives are that it is the least efficient AC unit on our list with an EER of 10.3. It also is really heavy at 136 pounds which makes it difficult to install. For large areas or extremely large rooms then we recommend the LG LW2516ER, but you will pay a premium and you if possible you might even want to consider buying multiple AC units instead.